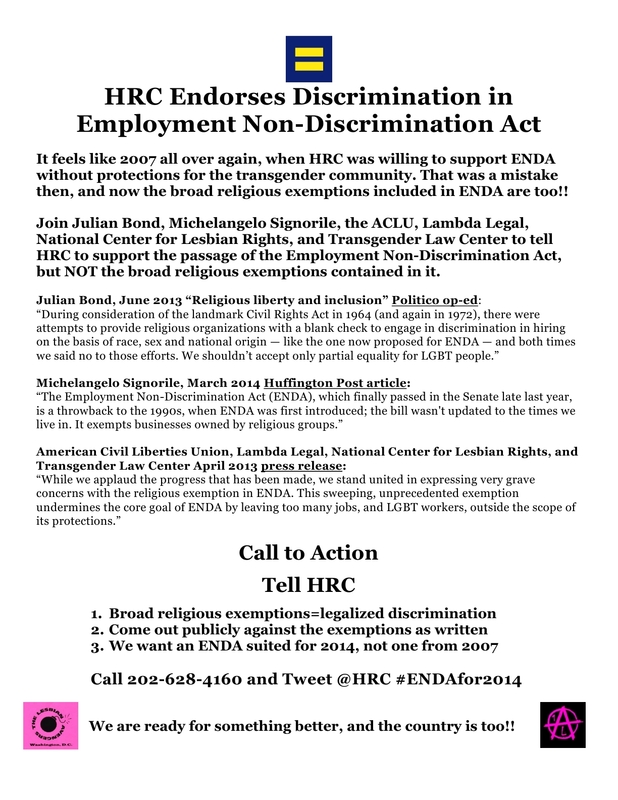 Last week, the Human Rights Campaign (HRC) announced a $2 million campaign to push for the House Vote on the Employment Non-Discrimination Act of 2013 (ENDA). This campaign partnership with Americans for Workplace Opportunity (AWO) is similar to the $2.5 one announced last July 31st to push for the Senate vote. Working closely with GOP donors, HRC seems content to codify legalized discrimination through the existing broad religious exemptions contained in the 2013 ENDA version passed by the Senate last fall. Organizations and individuals including Julian Bond and the ACLU have expressed grave concerns about these religious exemptions. They cannot go unchallenged. D.C wanted to welcome Kelly with some joyful troublemaking of our own! Panels were displayed on the wall of the HRC building highlighting the problems with the broad religious exemptions within ENDA 2013 through quotes from prominent people and organizations. In addition, a Call To Action was displayed for all coming to the Cogswell event to see. As we have reported on OBLOGDEE here and here, the broad religious exemptions contained in ENDA 2013 do not reflect or mirror the religious exemptions contained in the 1964 Civil Right’s Act, no matter how many times Tico Almeida of Freedom To Work says it. Those exemptions were put in place to protect churches and other religious institutions from having to hire religious leaders of a different faith. The 1964 Civil Rights Act exemptions had nothing to do with “protecting” a religious-affiliated hospital from having to hire an African American gardener, so ENDA 2013 shouldn’t allow a religious-affiliated bookstore to be able to fire a cashier perceived to be gay. HRC’s AWO is fine with throwing employees of religious-affiliated employers under the bus, just as they were happy to support ENDA 2007, which did not provide the transgender community with employment protections because they felt that was the only way to get the bill passed then. We support passage of the Do we really want to throw others under the bus now for the sake of passing a bill? Time for everyone to feel powerful. Please answer the call to action below, demand HRC come out against the broad religious exemptions contained in the bill they are pushing towards a vote! Here is the flyer for the campaign. Please share widely! Why are LGBT Organizations and Democrats Pushing for a BAD ENDA? Exactly. “Human Rights Campaign”–> what a frigging joke they are. More like, “we work hard to placate bigots & pretend we’re on the side of protecting all”. Jerks.